NEUSPEED N2 Clutch Kit - Pann Auto Performance - San Diego largest aftermarket automotive performance parts - What do you drive? NEUSPEED N2 Clutch Kits are available in two levels of performance: The Sport Clutch features a full-faced sprung disc, and the Sport Pressure Plate has a clamping force of approximately 1,800-psi, as compared to the factory unit’s 800-900-psi. Amazingly, NEUSPEED was able to engineer the pressure plate so that there is little difference in pedal pressure! The N2 Sport Kit is great for weekend racers, but is thoroughly streetable for daily drivers. 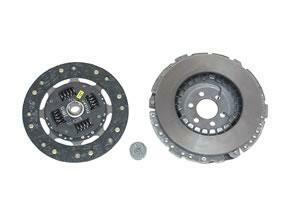 The NEUSPEED N2 Race Clutch features a multi-puck solid disc. This design is for race applications only! Since it has no springs to take up and smooth the engagement, severe and immediate engagement is to be expected. All pressure plate and disc kits come complete with bearing and alignment tool.